midwife arrives; we’re sure – things are happening, but not truly “active” yet. midwife has left; not far enough along yet; sad. 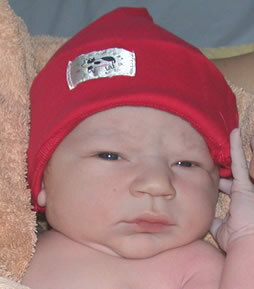 We are pleased to present Kampbell Anthony Frazer Featherstone – born 12:12pm June 3, 2004. Weighing in at 8 pounds 14 ounces, and 21 inches in length. He is healthy, mother Kathryn is doing very well, and his big sisters Kaitlyn and Kyla are being extremely helpful! Congrats, mate. All the best to wife and boy. Congratulations, Derek! May he have a long and prosperous life in peace and harmony. Congrats! There’s nothing quite like being a father! My little boy is almost 9 months now and what an experience it has been. All the best! Oh my God !! That is so cute, I can’t believe it ! Congrats Derek and Katherine and Co. ! Happy, healthy, hey ! Congratulations Derek and Kathryn and welcome to this world, Kampbell!! The boy’s here….now get back to work you filthy animal! Congratulations to you and your wife. He is so cute. Lots of sleepless nights ahead but I am sure you are a pro at that with two already. Congratulations to you and your wife! Three kids is amazing these days! A boy – how wonderful. He is just beautiful!! So pleased for you – congratulations. Rowan can’t wait to meet Kampbell. hat trick for the featherstones. nice one. and a boy, finally, well done. still betya the girls end up playing hockey, rugby, and softball, while the boy tries ballet. Love to Kathryn and the family, there is a litlle ‘wee something’ from Amsterdam for Kambell sailing across the Atlantic for the wee man this week! Congratulations, Derek! What a gorgeous little boy. I’m glad the sexes are a bit more evened out (even though the girls will always win in the end!). Hope everyone’s getting enough rest! Take care! The big question is what position is Kampbell going to play on the pitch?! How absolutely wonderful. It brings tears to my eyes! Congratulations to all of you! He’s adorable. Can’t wait to hold him!!! He is beautiful! Life is precious! Can’t wait till you bring him for a vist. Congratulations goes out to the whole family!!! He is absoloutely gorgeous. Looking forward to seeing him in the office!